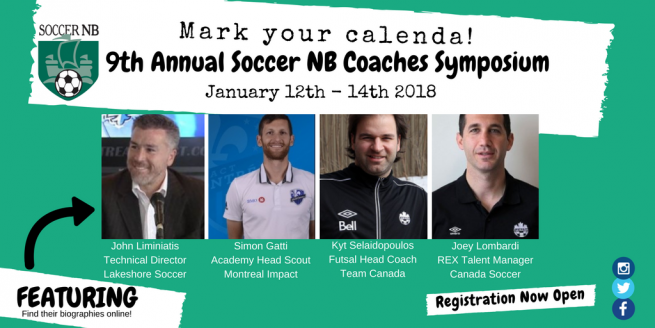 John Limniatis has been involved is soccer for nearly 40 years thus one of the most experienced soccer people in Canada. First as a youth amateur player, then a 14 year professional career in Canada, Europe and the US. Most notably with the Montreal Impact. He played 44 times for the Canadian national soccer team, also a former captain and was the head coach of the Montreal Impact. He was at that time the 1st ever Cana­dian to be sold to a Eu­ro­pean 1st di­vi­sion team. He was trans­ferred for a fee of $50.000. Limni­atis played pro­fes­sion­ally in Greece with First Di­vi­sion side Aris Thes­sa­loniki F.C. in 1988 to 1992 and Pane­to­likos in the Sec­ond Di­vi­sion from ’92 to ’93. He then joined the Mon­treal Im­pact in the sum­mer of 1993 and re­mained with the club until 1998, then played again for them in 2000 and 2001 play­ing 151 games and 13,976 min­utes, also the captain of the team for mul­ti­ple years. He also played for the Canadian National Youth teams as well as participating in the 1990, 1994 and 1998 World Cup Qualifiers with the senior team. A member of both the Quebec and Canadian Soccer Hall of Fame. In 2012, John was also inducted in the Quebec Sports Hall of Fame (Pantheon des sports du Quebec) as the first ever and only soccer athlete so far. One of a few ‘A’ license certified coaches in our country. Currently, he is the Technical Director of Lakeshore Soccer Club (4000 players), He has previously held the Technical Director position with other clubs and as Entraîneur Cadre of the Lac-St-Louie Region. John has coached youth teams (LSEQ), Quebec Provincial teams, Canada Games team and at the National Training Center. He has also coached in the professional level as the head coach of the Montreal Impact. A course director and an evaluator for the DEP, ‘B’ Provincial and National coaching licenses with the FSQ and CSA. Simon Gatti is a Canadian former soccer player and current head scout for the Montreal Impact Academy. Gatti joined the Montreal Impact as their first pick during the 2006 USL First Division college draft, where during his six seasons with the organization he won a league championship, and a Canadian Championship. Gatti, born in Welland, Ontario, is a dual Canadian-French citizen. He was a trialist for Sochaux‘s U-17 youth team in 1999, and played for French club Racing Club de Paris‘ youth team in 2000, before returning to North America to attend college. He initially began his career in his home region of Niagara with St. Catharines Wolves in the Canadian Professional Soccer League. He made the transition to college soccer by enrolling at the University of Rhode Island leading the team as co-captain from 2003 to 2005 while majoring in kinesiology. He reached his 100th career game start with the impact and received the Unsung Hero Award/Quatrième étoile de l’Impact for the second time in his career. His final statistics with the Montreal Impact include 122 games played, 100 game starts and 8,656 minutes played. Gatti announced his retirement in February 2012 and was subsequently hired by the Montreal Impact Academy to coach the U-14 team as part of the Montreal Impact Sport-Études program. He also served as the assistant coach of the USL Pro Team Montreal FC. Joey worked at the Ontario Soccer Association for 8 years as a Provincial Team Head Coach, Regional program manager and Coaching Learning Facilitator Joey coach’s with the U15 & U17 women’s national teams, works as a performance analyst with the Senior Women’s national team, and works closely with REX programs nationwide as a talent manager. He has a FIFA Futsal Level 1 coaching certificate (2011) as well as his Canada Soccer Coaching B Licence (2014). He has also served as Technical Director for CS Mont-Royal Outremont. Kyt played for Montreal Impact. During the 2004 season he assisted in the tream’s record 12-game undefeated streak, and won the A-League title, the club’s second North American Championship in team history. He would return to indoor soccer by signing with the Cleveland Force of the Major Indoor Soccer League in the winter of 2004. He would have stints with Milwaukee Wave, and the Detroit Ignition.